I have tried to give some technical and application related features of SAPL's Varsha Rainguns. Read more about the product features of Varsha Rainguns here. Sugarcane, Plantation crops such as coffee, tea, cardamom, etc., vegetables like Onion, cabbage, potato, cauliflower, carrot, beat root, tapioca, etc. and ground nut. It mainly depends on the effective root zone depth of the crops. For E.g. For sugarcane on an average a Rain Gun can irrigate nearly 1⁄2 acre in 1 to 1 1⁄2 hours. Using Flood irrigation, farmers nearly take 4 hours to irrigate 1⁄2 acre of sugar cane. For onion and vegetable 45 minutes is enough to irrigate 1⁄2 acre. Minimum requirement is 5 HP. This even depends on the Kg/Sq. cm (KSC) the pump generates. Our standard minimum requirement is 2 KSC pressure. No motor/pump less than 5 HP will generate 2 KSC Pressure. So, our requirement is >5H.P upto 20 H.P. Better result can be obtained at KSC more than 2.75. 4. What pressure will a 7.5 H.P. generate. The make of the pump, i.e. some pumps have low pressure but high discharge. This pump generates low pressure. Some Pumps generate high pressure with low discharge. Suction and delivery heads Delivery head – distance from the pump to the G.L.. Suction head – distance from the pump to the foot valve. If the suction head is more than 40 feet, much of the energy of the pump is wasted in sucking water upto 40 feet. So this will reduce the outflow pressure of the water. Lesser the suction, higher will be the pressure. Open well submersible pumps have ‘O’ suction head. So, we may get high KSC pressure in these pumps. Conveying distance between the pump and the Rain Gun. Larger the distance between the pump and the location of the Rain Gun, lesser will be the pressure due to frictional loss and conveyance loss. 5. What types of pipes should be used for Rain Gun. The best choice would be HDPE, ‘QPC’ pipes, which can be assembled and dismantled easily. If the KSC of the pump is less than 2.75, Rain Gun can be operated in PVC pipelines of quality. If the pressure exceeds 2.75 HDPE pipes will be the only choice. 6. What will be area covered by a Rain Gun. It again depends on the pump / motor. Higher the H.P., higher will be the KSC pressure. Higher the pressure, larger will be the throw distance. Area = 3.14 x 80 x 80 = 26,096 sq. ft.
7. How many Guns are required to irrigate say 10 acre of sugarcane. No. of water source the farmer has: If the farmer has 2 sources of water i.e. 2 wells or 2 bore wells, he can use 2 Rain Guns at different locations. 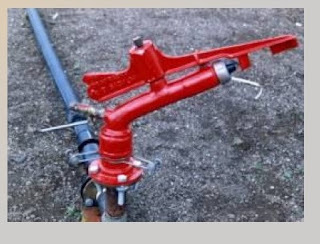 H.P of the pump available: If the farmer owns say a 10 or 15 HP motor, he can use 2 Rain Guns at a same time. Financial status of farmer: If the farmer is financially sound, he can purchase more than one i.e. he can install permanently one gun for 1⁄2 acre. So he need not shift each time after irrigating 1⁄2 acre. A farmer with just one Rain Gun can irrigate upto 20 acres by shifting the Rain Gun periodically after irrigating 1⁄2 acre. For this the farmer has to install a main pipeline (PVC/H.D.P.E) with deliver provision per 1⁄2 acre. In this delivery provision he can install the Rain Gun periodically. 9. What is the required height of the stand. It depends on the type of crop. For Sugarcane and cardamom, 5’ height stand is required. For other vegetables, tea, coffee, ground nut, etc., 3’ to 4’ height stand is enough. How uniform is the distribution of water from Rainguns and how the distribution uniformity can be improved.